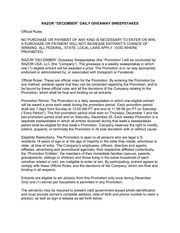 This PDF 1.5 document has been generated by Microsoft® Word 2010, and has been sent on pdf-archive.com on 27/02/2014 at 02:24, from IP address 50.58.x.x. The current document download page has been viewed 472 times. File size: 89 KB (6 pages). PARTICIPATION IN THOSE AREAS ONLY. in no way sponsored, endorsed or administered by, or associated with, Facebook, Inc.
(“Facebook”). You are providing your information to Sponsor and not to Facebook. 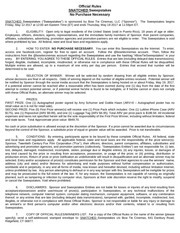 Promotion Description: The Promotion begins on March 24, 2014 at 12:01 a.m.
of the Promotion and Pacific Standard Time shall control for all purposes of this Promotion. 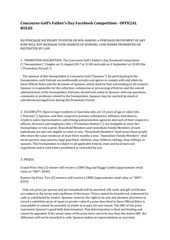 (the “Instant Win Game”) and a sweepstakes (the “Sweepstakes”). not related, are ineligible to participate in the Promotion. attempted form of participation in the Promotion other than as described herein is void. (200,000) Points are available for the Instant Win Game during the Promotion Period. number of eligible Entries received during the Promotion Period. other tax liabilities arising from accepting a Prize will be the sole responsibility of the winner. restrictions or limitations regarding these limitations or exclusions. to an alternate Potential Winner selected from among the other Entries at its sole discretion. or any other person's computer related to or resulting from participation in the Promotion. each of them from and against any and all liability, damages, costs, attorneys fees, etc. majeure event will not be considered a breach of these Official Rules. these Official Rules shall be given effect as if they had not included the severed term herein. Francisco, California 94111-4632. All requests must be received by May 8, 2014. © 2014, MyPoints.com, Inc. All rights reserved. This file has been shared by a user of PDF Archive. Document ID: 00148818.